Can You Balance the Reindeer?Can You Balance the Reindeer? Can You Balance the Reindeer? Santa needs your help! 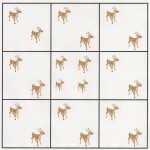 The 4 sides below–top, bottom, right, and left–each have 6 reindeer. 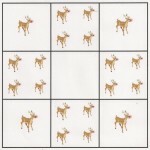 Santa wants to move the 4 reindeer in the middle pen to the outer pens–and still have 6 reindeer on each side. Is this possible? Can you advise him how? This one is not easy. Did you get it? Download Balance the Reindeer, print it out, and present this challenge to your friends!